Top (BOGO 50%) / Skirt: Fiore Boutique Kennesaw / Shoes (marked down to $39!) / Clutch / Necklace via Rocksbox / Bracelet via Rocksbox / Earrings: color sold out but you can get on the waitlist! Hiiiiiii, I’m back! Thelast month has been an absolute dream, and after a much needed break I’m trying to get back into my school and blog routine. Last week was the first week back in school, and I was so not ready for that jelly. The post-vacation depression is slowly wearing off, but the extra fluff from it is definitely still here, bye Felicia. Now for the outfit details. This tank is a must have in your wardrobe. It’s something you can wear year round layered under blazers or solo in the summer like above. It comes in a lot of colors, and you even get two-for-one because they’re reversible. 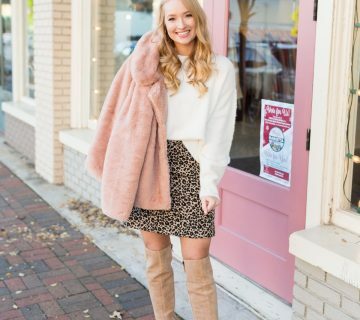 I’ve worn this skirt from Fiore Boutique before (see the look here), and it’s been a piece in my wardrobe that makes me feel most like myself. It’s pink, girly, and comfortable… check, check, check in my book! Now lets talk about the shoes. They’re so comfortable, and not in the “oh they’re comfortable for heels” kinda comfortable, but are actually shoes you can wear all day. OH, and they’re marked down from $120 to $39! They sometimes switch between gray and more of a taupe, so I think they’re very versatile. For my accessories, these fun earrings were a purchase just before Arizona because I needed some turquoise in my life. Is it considered a neutral yet?! 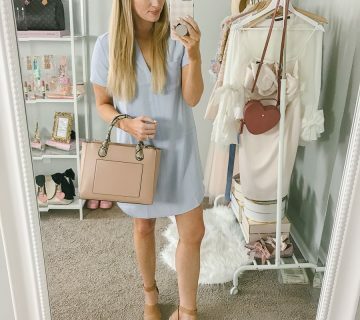 My little necklace was purchased from Rocksbox, because I can never pass on discounted Kendra Scott when I receive them in my box every month… oops! Use code strawberrychicxoxo to get your first month free as a test drive. Free jewelry people, that’s a no brainer! As a little side note, I’ve updated all my sidebars and shop page so be sure to check them out before they change for fall! Also, you can now shop all my Instagrams here! Now to make my coffee a double and get to school. Happy Monday! You look so beautiful! I love the bright pink skirt paired with the blush tank. And the leopard clutch is a great addition to the outfit! Those wedges are so chic, and that clutch seems like it goes with everything!